Accepting the award on behalf of James Barton are his wife, Betty Barton, and his son, John Barton. 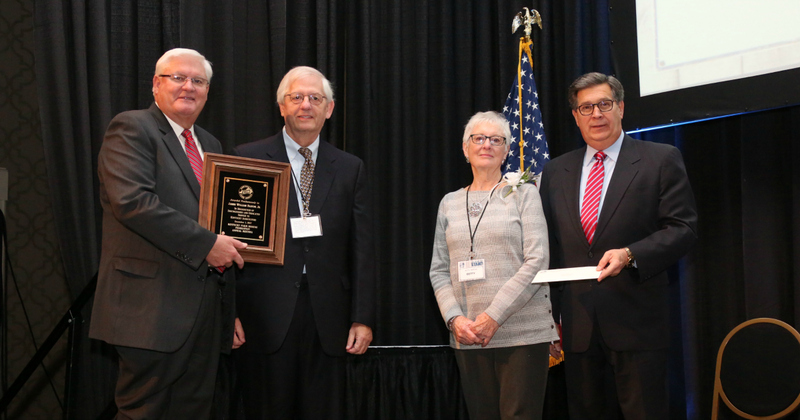 Mr. James Barton was awarded the 2017 Distinguished Service to Agriculture award at Kentucky Farm Bureau’s annual meeting, held in Louisville. The award was presented by David S. Beck, KFB Executive Vice President (left), and Mark Haney, KFB President (right). Louisville, KY (December 1, 2017) – Fayette County farmer James William Barton, Jr. has been named winner of Kentucky Farm Bureau’s (KFB) annual award for Distinguished Service to Agriculture. He was honored at the organization’s 98th annual meeting at the Galt House Hotel. Mr. Barton passed away earlier this year. Mr. Barton spent 62 of his 83 years on his farming operation, and 37 years of that with Barton Brother’s Grain. The farm consists of tobacco, grain, livestock, and fruits and vegetables. He began farming with his father and did so while in high school and college. He bought his first farm in the early 1960’s. Today, his brother, two sons, and a grandson still operate the farm. And over the years all six of his children, and most of his grandchildren, have been involved during their school summer breaks. Mr. Barton was known as an early innovator in many agricultural practices including no-till production, round hay bale technology, and precision agriculture. He also helped lead the way in selling loose leaf tobacco and baled tobacco. Mr. Barton was also instrumental in many leadership activities including being a founding member of the Kentucky Corn Growers Association, Secretary of the National Corn Growers Association, a founding member of the Kentucky Hemp Growers Association, President of the Burley Producers Market Association, member of the Central Kentucky Pork Producers, and winner of the Kentucky No-Till award from the National Resource Conservation Service. Mr. Barton was also a supporter of the purchase of development rights efforts in Fayette County. He supported youth through educational programs such as 4-H and FFA, as well as the Farm Bureau Youth and Young Farmer programs. As a Farm Bureau member, Mr. Barton helped establish the Fayette County Farm Bureau auction in which proceeds go to support educational scholarships. To view or download the photograph that accompanies this story, click here.